The Special Olympics will feature several unified sports. 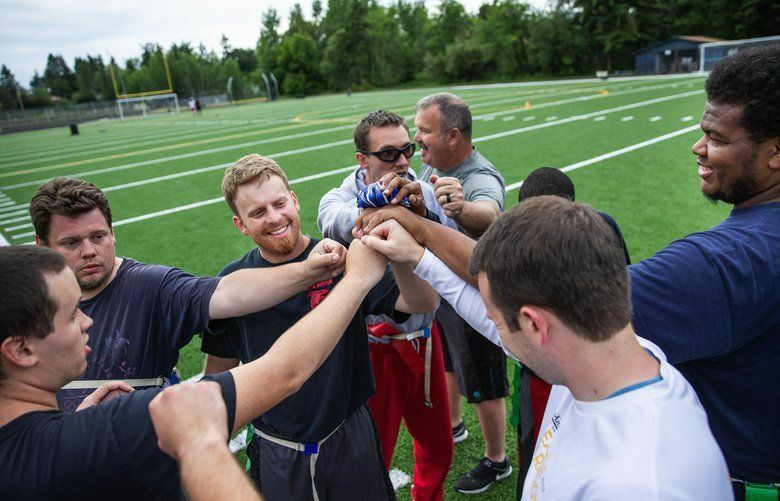 These teams combine "partners" -- people without intellectual disabilities -- with athletes, those with intellectual disabilities -- competing as equals on the same team. Clay Williams shied from being interviewed. As most coaches, he wants the focus to be on his players. 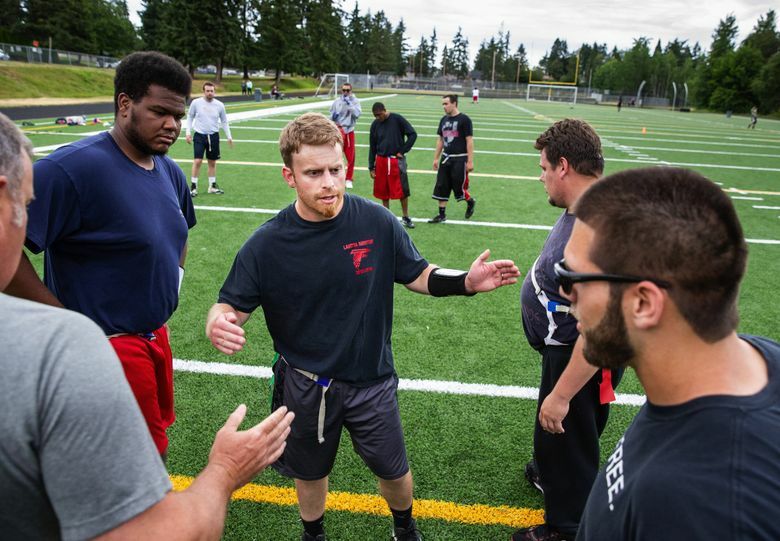 But in many ways, the Federal Way Thunder wouldn’t exist without people like Williams. Someone has to set the example to show sports aren’t for a specific gender, race or ability and that a competitive fire can be a universal trait. It’s a reason Williams, 30, first became a partner in unified sports and now is volunteer coaching the Thunder, a unified flag football team vying for a medal in Special Olympics. Williams is one of Team Washington’s 38 “partners” — those without intellectual disabilities, who’ll compete with athletes with intellectual disabilities. However, regardless of title, the players all perform the same functions on the field. “Really, what it is is a bunch of guys who like to play football,” said Williams, who’s led the Thunder since its inception in 2015. During five-on-five flag football games, two partners and three athletes out of the nine-player roster are on the field at the same time. The only rule for “partner” football players is they cannot pass to each other. 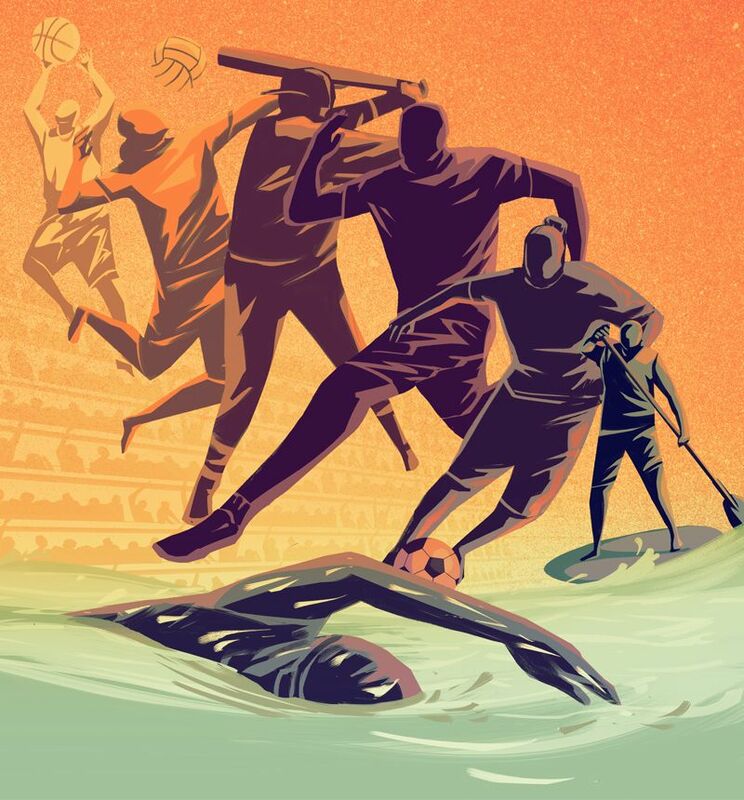 The other team sports have similar stipulations to assure the athletes are the focus of the competition, even though some unified sports like softball and volleyball have equal numbers of partners and athletes playing at the same time. And that’s where all distinction between partners and athletes ends. Normalcy is the mission, so when Williams played on a unified basketball team, he says, he barely got any court time because he wasn’t good enough. It’s no different from when he was cut during basketball tryouts at Kennedy Catholic. The Thunder is one of seven unified teams that will represent Washington. There also are the Whatcom Slammers and Timberline High unified basketball teams; BKAT Unified Softball, a team from Bremerton; and unified soccer teams in the Clark County Bulldogs, Othello High and University High. The Federal Way Thunder was invited to participate in Special Olympics by winning a state tournament in December. It was a comeback victory in which Williams said he felt his defensive scheme was exposed. He sat with his youngest brother Alex, who’s a partner for the Thunder, and his football enthusiast brother-in-law, after a family dinner that month, designing a new defensive set on a napkin. Williams said he hopes the setup will stifle opponents in the Games. The Thunder’s biggest asset is Troy Marsh, a 28-year-old with Autism Spectrum Disorder. A lithe, 6-foot-2 pass-rusher, Marsh has become known for his skill in getting what would be tallied as sacks in tackle football. On offense, the Thunder players wear wristbands that conceal their playbook consisting of 48 plays. The Thunder players are serious about their football. At the players’ request, their twice-weekly, 90-minute practices were bumped up to three times a week the past four months in anticipation of the Games. And Williams’ drills are similar to those run by high-school or pro coaches. “When Coach Clay first recruited me to play, I was expecting to come out, jog around, take it easy and have a light touch,” said quarterback Sam Shelton, 33, a partner who has made inclusivity his life’s work since attending high school at Decatur. Shelton worked with students with disabilities in high school, and his first job out of high school was as an inclusion coordinator for the City of Federal Way. He’s now a mental-health therapist for at-risk youth in Olympia. The Thunder will play in the top level of competition with unified partners. The other divisions feature teams comprised of athletes only and intercollegiate unified teams from college campuses across the nation. There also are interscholastic unified teams where the athletes and partners are high-school students or younger, but none will compete in flag football at Special Olympics. Team Washington’s Timberline (basketball), Othello (soccer) and University (soccer) are examples in the other sports. Teams and competition brackets always are formed by matching athletes and partners of similar age and skill level, regardless of gender. Some teams are broken down by gender, but coed teams compete in male divisions. Team Washington’s teams in flag football and softball are both all-male. Overall, the Games are estimated to draw 4,000 athletes with intellectual disabilities and 600 partners. They’ll compete in 14 events during the six days at various venues within a 40-mile radius of the city. 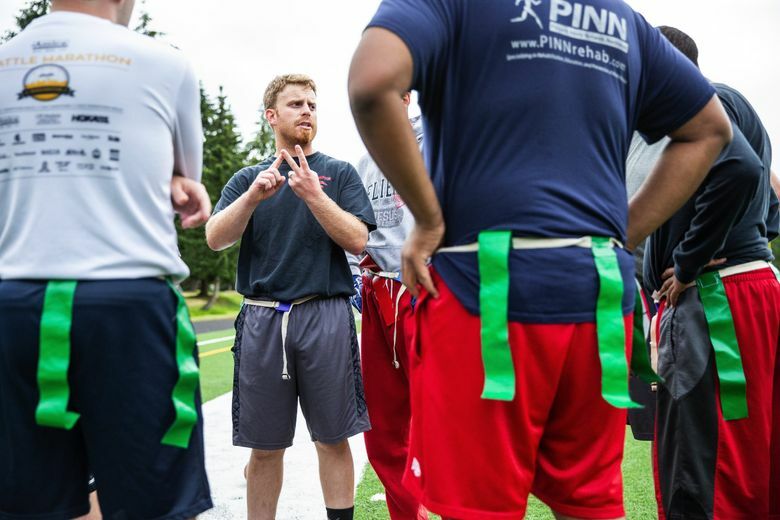 The flag football competition begins Monday at the IMA Sports Field on the University of Washington’s campus. Other sports include athletics, bocce, bowling, golf, gymnastics, powerlifting, stand up paddle board, swimming and tennis. Additionally, unified gaming will be introduced this year where athletes pair with partners to play a video game. All Special Olympics events except the Opening Ceremony are free to the public. It’s a big week for the Thunder players who’ve worked hard to get to the Games. Marsh and his teammates share that sentiment. Most joined the Thunder through the Federal Way Parks and Rec Department as a way to build friendships while having fun playing a sport. None of the partners or athletes expected the whirlwind they entered as part of Team Washington. In the lead-up to the Games, the Thunder had a training camp with the Seahawks and played an exhibition with the Seattle Majestics, a women’s football team. The Thunder was featured on local television and the players have made numerous appearances around the region — from farmers’ market openings to school assemblies — to help promote Special Olympics. Shelton said the extended time spent together has made the players refer to each other as brothers. Alex Williams added that while their role as partners is integral to the success of Special Olympics and the mission of unified sports, they likely benefit more than those with disabilities.